While vastly different stylistically from other Disney animated films but still embodying the excellent quality one expects from the Mouse, 101 Dalmatians is a movie worthy owning and the diamond edition Blu-ray. "Everything old is new again" and in this vain Disney has rereleased the animated classic 101 Dalmatians. This special Diamond Edition introduces the 1961 film to a whole new audience and is sure to delight anyone who watches it. Regardless of whether or not you've seen it before, the Blu-ray/ DVD is a great purchase to add to your collection. 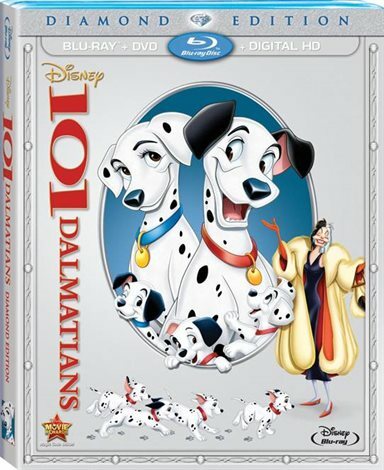 Based on the children's book, "The One Hundred and One Dalmatians" by Dodie Smith, the movies tells the story of Pongo, Perdita and their adorable puppies. Of course no Disney story would be complete without a horrible villain - in this case, the fur loving Cruella De Vil. When Cruella decides her next fur coat will be Dalmatian, she first tries to buy, then steals the puppies. In a quest to find their pups and bring them home safely, Pongo, Perdita and their human owners – Anita and Roger, go on an adventure filled ride. With the help of some other famous dogs (think Lady and the Tramp), the family is reunited and, like all good Disney movies, the evil villainess is defeated. When it was made in 1961, 101 Dalmatians was different than any other Disney movie that had been previously been made. Since the cels for the film were copied on a machine instead of traced by hand, the movie had a different look and feel and was produced faster and less expensively than its predecessors. The scenes were not as sharp and crisp but the drawing style was modern for the time and Dalmatians was the first Disney film to show moving cars which had been created using 3-D Models. This latest Blu-ray is packed with extras that are all worth watching. Besides the classic extras that include interviews with the Animators and an old Disney short film, there are new extras added. Disney Channel's Cameron Boyce gives us the top 5 things that are great about 101 Dalmatians while plugging the new film he stars in, Descendants. "Lucky Dogs" speaks once again to some of the members of the Disney team who worked on the film and Walt Disney's 1961 The Best Doggoned Dog in the World, is an hour-long episode that explores the history of purebred dogs and highlights some pretty incredible dogs from around the world. The 1080p high definition video really enhances the viewing pleasure of this classic. The colors are so vibrant and pop right out of the screen and the scenes are not grainy at all. The audio is presented in 7.1 DTS-HDMA, which compliments the video beautifully. The combination is an excellent pairing, which breathes new life into this older film. For more information about 101 Dalmatians visit the FlickDirect Movie Database.